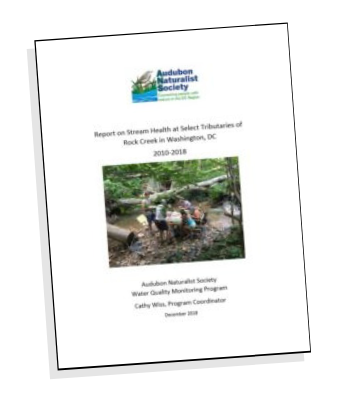 The Audubon Naturalist Society Water Quality Monitoring Program is one of the largest and longest-running community science programs in the country. Since the early 1990s, the program has operated throughout Montgomery County, Maryland, and in parts of the District of Columbia. We provide our data to government agencies and to others upon request. 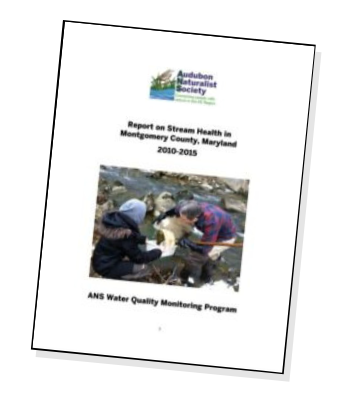 Learn more about the history of water quality monitoring at ANS. 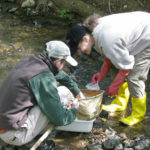 Teams of volunteer monitors visit stream sites in April, July, October, and optionally during the winter. They conduct habitat assessments and collect and identify “benthic macroinvertebrates,” small organisms that live in the streams. Because these organisms exhibit a range of sensitivities to pollutants and stressors, they help us determine the streams’ health. 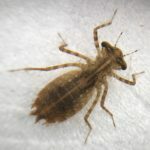 Our program is distinct in that our monitors identify aquatic insects to the taxonomic level of family. This gives us a clearer picture of aquatic diversity and stream health than more general identification practices. Our program is also unique in that monitors learn to identify the organisms in the field and then release them alive, rather than preserving them in alcohol and sending them to a lab for identification. Each team has a designated leader who is certified in identification. New volunteers are teamed with experienced monitors at stream sites convenient to them. 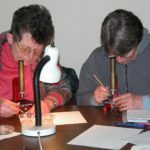 Our water quality classes give volunteers the information they need to monitor. See what it's like--check out the video below! Before going into the field, new monitors should have a basic knowledge of macroinvertebrate identification and stream ecology, either from previous training or by attending ANS’s water quality classes. Volunteers should also be willing to commit to at least two seasons of monitoring. Ready to join a monitoring team? Apply Today! Where We Monitor: see a map of all our community science data. Uncheck the box marked "Critter Survey" at the top left to see only Water Quality Monitoring sites. Check out the Conservation Blog for more news and reports from our community scientists! For questions about monitoring with ANS, email Cathy Wiss. For information about water quality monitoring in Northern Virginia, email Dan Schwartz with the Northern Virginia Soil and Water Conservation District. For information about the Chesapeake Monitoring Cooperative and bringing together volunteer data for government decision-making, click here. Calculating an Index of Biological Integrity (IBI) for Maryland Streams: The family-level calculations for a Benthic Index of Biological Integrity (BIBI) are described on pp 27-34.